After finishing watching the entire Gossip Girl series again I obviously had to create a nail tribute. 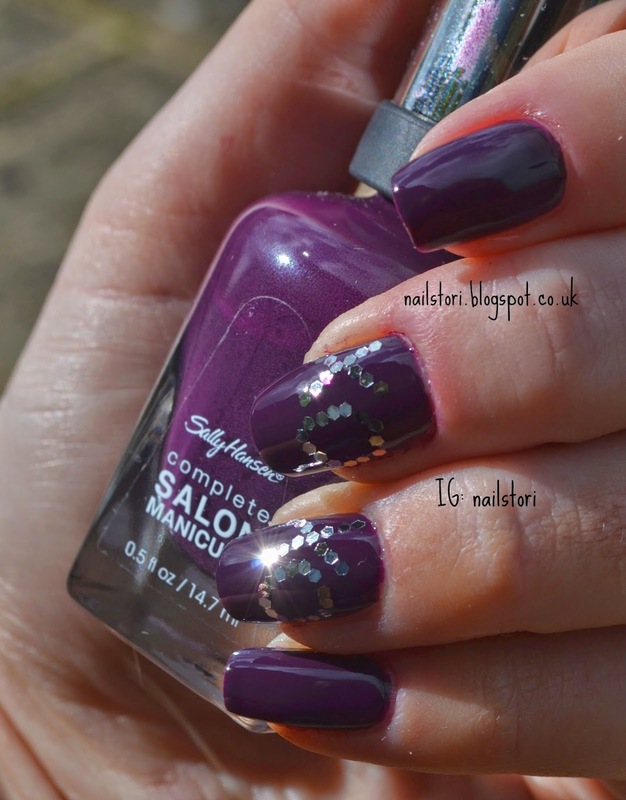 I used: OPI – Natural Base Coat, Sally Hansen – Plum Luck, Sally Hansen – Top coat and Born Pretty Store Glitter. The picture really shows how the Born Pretty Store glitter looks in the sun – it is so nice, makes the detailing really stand out. It also shows how good the Sally Hansen top coat is – makes any polish so shiny. I love it! This Sally Hansen colour is gorgeous, even better because it is a TKMaxx bargain. Definitely going to be wearing this one more. I am absolutely loving the shape of my pinky nail – shame the others aren’t long enough for that shape yet. Also, the clean up of my middle finger is so bad, it went horrible all in my cuticle and I couldn’t get it off without ruining the whole mani so I got over it! Not sure what designs will be happening next week – need some nail inspo! A direct link below to purchase your own born pretty store glitter.